In Part 1, I documented how Camille Parmesan’s 1996 paper (heralded as proof that global warming was forcing butterflies northward and upward) had misread landscape change for climate change, how she failed to publish that “extinct” populations had now recovered and refused to provide the data to permit replication of her iconic paper. In Part 2, I documented how Parmesan hijacked the conservation success story of the Large Blue and the detailed conservation science of Jeremy Thomas in order to again blame global warming for expanding the range of endangered UK butterflies. In Part 3, I document how Parmesan kept half the evidence “off the books” to suggest extreme weather, supposedly caused by rising CO2, was causing population extinctions in the Sierra Nevada, and our top climate scientists then embraced and spread that myth. “Twenty years of studies at one site in the Sierra Nevada of California have implicated three extreme weather events in carving a pathway to extinction of a whole set of E. editha populations at 2400 m.
Parmesan and her colleagues argued that CO2 warming had triggered cold events, which disrupted the “synchrony” between the weather, the butterflies and their food plants. Unlike Jeremy Thomas who was seeking to save an endangered species, Camille Parmesan was not interested in the details required for successful conservation. She was looking to support her global warming theory admittedly “searching for a climate fingerprint rather than critiquing each study”.4 And she knowingly omitted contradictory details and failed to mention that the other half of her observed population had prospered during those same events. I say that she knowingly omitted the details because her future husband, Mike Singer, and C.D. Thomas wrote the research papers from which Parmesan manufactured her extreme weather story;5,6 when written, Parmesan served as their field assistant. Although weather is involved in each and every wildlife boom or bust, her reported extinctions had everything to do with how land use had changed the butterflies’ “microclimates”. Parmesan directed the reader’s attention to just one of two neighboring populations. Both populations were literally within a stone’s throw of each other and normally they would be considered two halves of the same population equally affected by global warming. Yet only one half went extinct while simultaneously the other “natural” half survived. In fact by all accounts, the natural half didn’t just survive the “extreme weather”, it thrived! In the early 1960s, only the “natural” half ever existed. As far as we know, it had always inhabited the rocky outcrops where the Sierra Nevada’s thin, glaciated soils prevented dense forest growth and permitted sufficient sunny patches for the caterpillars to warm their bodies. In contrast, the extinct population had just recently colonized habitat created in the 1960s after the US Forest Service had expanded logging into higher elevations. The logging opened the canopy to the warmth of the sun and created new microclimates. Parmesan’s extinction story was a very selective retelling of the referenced study, “Catastrophic Extinction of Population Sources in a Butterfly Metapopulation”6 and a second companion paper.5 The caterpillars of the surviving natural population had fed mostly on a hardy perennial plant, which easily survives the Sierra Nevada’s erratic weather. The half-population that went extinct uncharacteristically fed on a fragile annual species, Collinsia torreyi, that typically invades logged areas. The checkerspot in the Sierra Nevada rarely laid its eggs on Collinsia, because normally it was not a reliable food source. But recent logging near their natural habitat changed all that. Not only did logging open the forest floor to more sunlight, it also exposed deeper soils that had been enriched from the logging debris and burn-piles. That human disturbance created the just-right conditions for the annual Collinsia to survive for much longer periods. Serendipitously it also created a novel butterfly-plant synchrony. A longer-lived and more abundant Collinsia could now sustain the full development of hungry caterpillars. With the life cycles of Collinsia and the checkerspot temporarily in synchrony, Collinsia suddenly became a valuable food resource. The butterflies from the outcrops opportunistically colonized the logged area and created the new second population. However this serendipitous food supply had simply prompted a boom and bust, not unlike the nearby ghost towns during the Sierra Nevada gold rush days. The deadly logged landscape had altered the microclimate and thus the timing of the caterpillars’ emergence from diapause. (Diapause is a period of inactivity and reduced metabolism similar to hibernation) In the Sierra Nevada, the checkerspot caterpillars diapause throughout the winter, snuggled safely under the soil and surface debris. Over the millennia, the caterpillar has evolved an instinctual sensitivity to the critical weather cues that triggered the safest time to emerge from their subsurface retreat. However, logging had opened the forest canopy, changing the pattern of snowfall accumulation, snow melt and forest-floor vegetation. Just as one centimeter of taller grass had cooled the subsurface for the Large Blue’s ant hosts, the recently logged forest floor was also heated differently. That sent the wrong signal to the diapausing caterpillars. Extreme weather affects adjacent locations equally; however, it is the different microclimates that determine how the animals respond. D.R. Easterling from the National Oceanic and Atmospheric Administration (NOAA), Thomas Karl, now the director of National Climatic Data Center and G.A. Meehl, the Senior Scientist at the National Center for Atmospheric Research were advocates looking to support CO2-caused warming. In their 2000 paper Climate Extremes: Observations, Modeling and Impacts, Easterling et al. wrote, “if there are indeed identifiable trends in extreme climatic events it would add to the body of evidence that there is a discernible human affect on the climate.” Apparently feeling a need to promote a greater sense of urgency, Easterling, Meehl, and Karl uncritically embraced any research that linked rising CO2 levels with extreme climate events and biological tragedy, and to that end they had invited Parmesan to coauthor their paper. 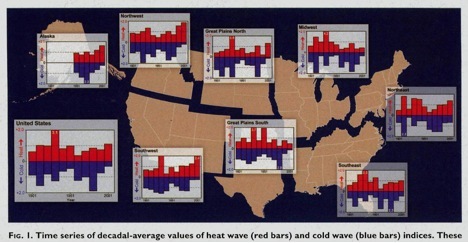 A 2013 State of Knowledge Paper paper by 27 climate scientist has confirmed that for the contiguous USA, heat waves and droughts are still less common than in the 1930s and 50s as their graphs below depict. Although the authors offered mixed interpretations and caveats, the data was clear and they wrote, “For the conterminous United States (Fig. 1) the highest number of heat waves occurred in the 1930s, with the fewest in the 1960s. The 2001-10 decade was the second highest but well below the 1930s. As shown in the graph below from 2013 State of Knowledge paper, mega-droughts far worse than the 30s and 50s happened over a thousand years ago based on reconstructed from tree ring data from 800 to 2000 AD. Yet despite the lack of any evidence of unusually extreme weather and the lack of reliable data, Easterlng and Parmesan’s paper ironically marked the beginning of an era in which every weather event would soon be translated into “unprecedented extremes” caused by CO2 climate change, and again Parmesan’s butterfly effect was again instrumental in promoting biological doom. Did Parmesan also not tell them the natural populations in unlogged habitat had experienced their greatest survival during her purported “extreme weather” event? Did Easterling, Karl and Meehl not know Parmesan’s paper kept half the evidence off the books? Or did their CO2 advocacy turn a blind eye to bad science? 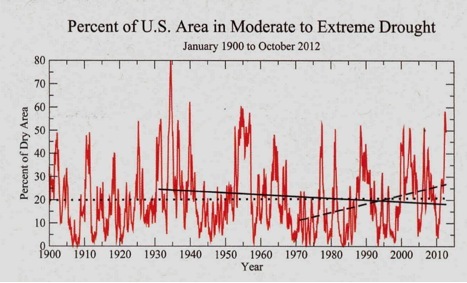 Despite no increase extreme weather and no real biological catastrophe, the paper Climate Extremes: Observations, Modeling and Impacts is cited by over 1,650 papers to build a consensus and the public is bombarded with fear mongering that we should “Be Very Afraid”. What I fear most is how the politics of climate change has defiled good science and good environmental science! 1. Singer, M., and C. D. Thomas (1996) Evolutionary responses of a butterfly metapopulation to human and climate-caused environmental variation. American Naturalist, vol. 148, p. S9–S39. 4. Parmesan, C. and Yohe, G. (2003) A globally coherent fingerprint of climate change impacts across natural systems. Nature, vol. 142, p.37-42. 5. Singer, M., and C. D. Thomas (1996) Evolutionary responses of a butterfly metapopulation to human and climate-caused environmental variation. American Naturalist, vol. 148, p. S9–S39. 7. Peterson, T., et al. (2013) Monitoring and Understanding Changes in Heat waves, Cold Waves, Floods and Droughts in the United States, State of Knowledge. Bulletin of the American Meterological Society. June 2013, p. 821-834. 1. If a population is extirpated in a logged area and the adjacent population simultaneously thrives in the natural habitat, is landscape changes or climate change the most likely cause of extirpation? 2. Do researchers purposefully ignore contradictory evidence, or do they suffer from attentional blindness? 3. Do climate scientists read the papers they cite to suggest that less than one degree of change can extirpate a species?